It has all the makings of a great academic fist-fight. * In a classic 1998 article, Walter Korpi and Joakim Palme wrote a hugely influential article called ‘the paradox of redistribution,’ which argued that a targeted benefit system ended up achieving redistribution than a more universal one (see here). Now in 2013, three Belgian academics have written a working paper that claims that the paradox is no longer true – in other words, that there is simply no general relationship between targeting, universalism and redistribution. This debate clearly matters. But who is right? Looking at the evidence, Korpi & Palme (and others) claimed that countries that had a greater level of income transfer targeting achieved less redistribution. This is partly explained by the well-known problems of means-testing, and partly through political dynamics: welfare states that don’t include the middle-classes will have less political support, so the total budget for income transfers will be much smaller. Marx et al’s grounds for challenging this is based on going back to the evidence, and looking carefully at whether the basic claim still holds. Their short answer is: no. Let’s look first at their main chart, that tries to be as comparable as possible to Korpi & Palme, but with recent data that enables us to look at a much wider range of countries. 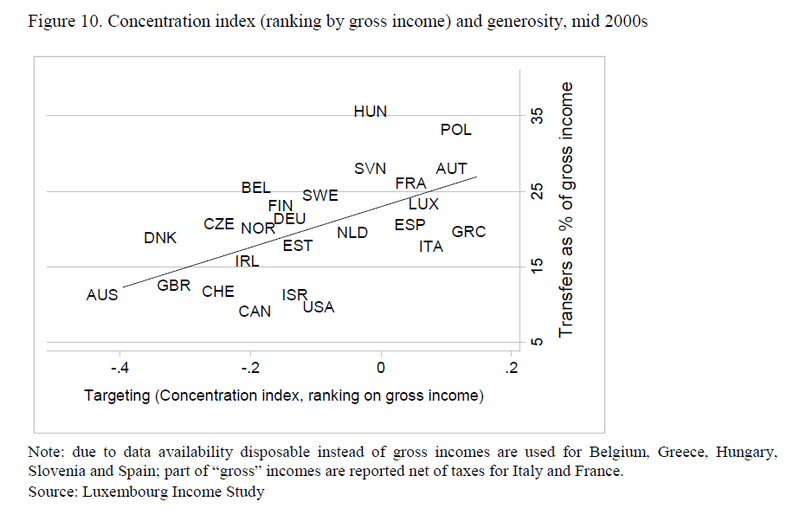 This clearly shows that there is no relationship between targeting (measured by the concentration index, which is like a Gini coefficient for transfers) and redistribution (measured by the difference in the Gini coefficient after taxes and transfers are added). So why the different result, given that they try to follow Korpi & Palme as closely as possible? Well aside from other reasons I explore below, a key issue is about the countries that you include. Korpi & Palme used all of the countries that they had data for at the time, but data is now available on more countries – notably countries in Southern Europe (x3), former socialist states in Eastern Europe (x4), and other advanced economies (x4). And the results are changed particularly by the additional Southern European countries – Greece, Spain, Italy – where the level of universality is high, but the level of redistribution is low. As Marx et al describe them, these are countries that provide “generous benefits for core/regular workers, modest benefits for peripheral/irregular workers …and meagre entitlements, if any at all, for those with no formal labour market attachment.” Moreover, social assistance is often patchy and not provided at the federal level, and the societies rely to a high but unknown degree on extensive intra-familial sharing (e.g. where generous pensions help support younger generations). ‘Universality’ may only be associated with more redistribution, then, for forms of universality that are closer to Austria than Greece. But while the short answer is that the paradox no longer holds, Marx et al also go beyond this. There are a host of different arbitrary methodological decisions underpinning these estimates – both the way you measure targeting (e.g. whether you define people as low income based on what they get after transfers vs. before them), and the way you measure redistribution (e.g. whether you include the effects of taxes or not). 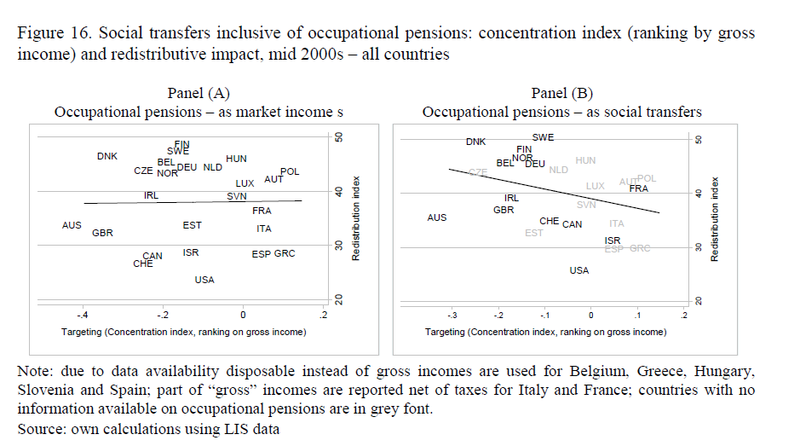 And these methodological decisions matter – for example, if you decide that occupational pensions are a social transfer rather than market income, then more universality looks like its association with less redistribution! A final critical point is that the relationship of targeting and redistribution seems to change over time. They use the work of American political scientist Lane Kenworthy, whose recent book Progress for the Poor tested the paradox of redistribution over different time periods. Kenworthy found that Korpi & Palme’s claim was true for the original 1985 data, but had weakened by 1995, and vanished completely for 2000/2005. Does this mean that we can stop worrying about the effects of means-testing, and accept austerity by reducing universal benefits? Well, not so fast. Firstly, targeting is still associated with lower generosity, as Korpi & Palme have always claimed. 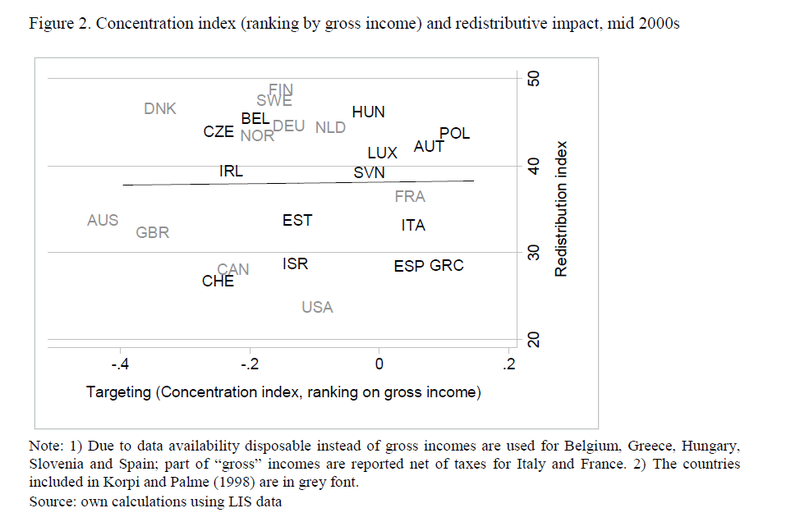 As Marx et al note, “the strongest redistributive impact is achieved by countries that combine moderate (Sweden and Finland) to strong targeting (Denmark) with comparatively high levels of spending.” At the very least, it seems likely that any pro-poor impact from greater targeting is counterbalanced by decreased levels of transfers. Secondly, targeting is definitely not the same as means-testing. As the authors note, “a universal old-age pension system may be characterised as highly targeted if the elderly disproportionately cluster at the lower end of the income distribution.” So I’d be highly cautious about using this to talk about the impacts of means-testing – the Nordic countries (conventionally thought of as minimising means-testing) score highly on targeting, with Denmark scoring as highly as Britain. This seems a bit strange based on my cursory knowledge, notwithstanding recent moves within Denmark since the period this data refers to. Still, it does get us to think that a mantra of ‘targeting bad, universalism good’ is a bit over-simplistic. There’s something about the Nordic countries that leads to more redistribution than Britain or the US, and it’s somehow linked to ideas of universalism, but it can’t simply be reduced to this kind of measure of targeting. And likewise, the changing nature of targeting over time suggests that not all targeting is equal – some of it may lead to more redistribution in the long run, and some of it might lead to less. The hope is that this study will stimulate a fine-grained debate about when and where means-testing and other forms of targeting have particular effects. Or in a single sentence: the paradox of redistribution isn’t dead – but its life is a lot more complicated than it used to be. *OK, so this isn’t strictly true – the authors thank Joakim Palme for comments on a draft paper, and everyone seems like they’ve been perfectly nice to one other. This is what arguments in Social Policy are often like. This entry was posted in Articles and tagged cross-national research, disparities, income dispersion, measurement, welfare payments. Bookmark the permalink. 1 Response to Is ‘the paradox of redistribution’ dead?